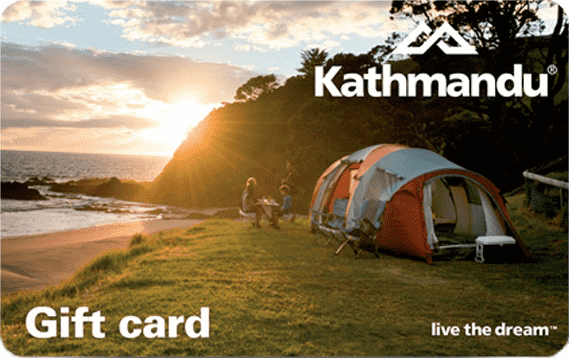 Moon river, wider than a mile the song goes, and this issue we’re crossing it in style for the Full Moon Paddle, as guests of Yamba Kayaks on the Clarence River. We meet at 7pm as the dusk descends; the moon rose about an hour ago but is obscured by clouds. The Clarence is calm, with just a slight breeze riffling over the water from the ocean. After introductions, Phil and his daughter, Isabelle, kit us up with life-jackets, head torches and dry-bags for our cameras, keys and mobiles. 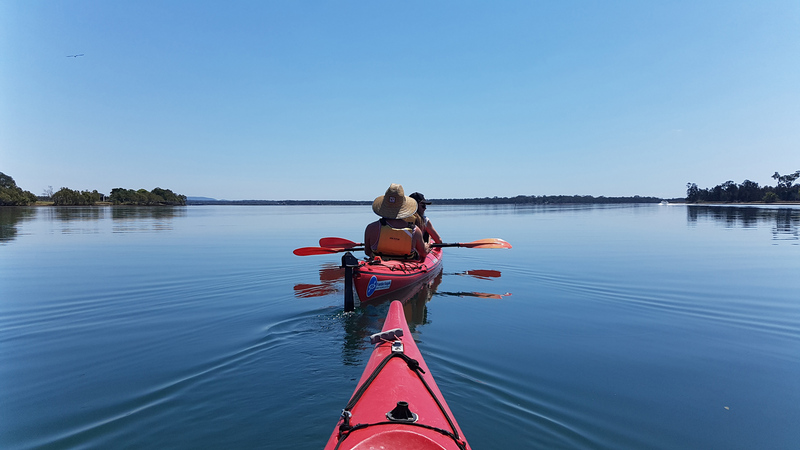 Phil makes sure everyone is comfortable and gives us a quick ‘how-to’ about paddling, steering and having some fun – apparently these kayaks are nearly impossible to capsize. We set off, through Yamba Harbour towards Dart Island. In the distance the trawler fleet is heading out to sea; the swell from their wake rocks the kayaks just enough to make it feel adventurous. I am taking it easy in the front with my camera while my teenage son, Sam, does the paddling and steering. We all share double kayaks and there is a wide range of ability between us, with a few guests never having paddled before. Some streak ahead, while others are happy to glide along at a leisurely pace. We pass Whiting Beach and cruise smoothly beside the rock wall, paddling easily with the incoming tide. It’s almost dark and the clouds have disappeared. Sam is getting into the swing of the whole thing, deftly positioning me so I can photograph the girls, who zoom past us grinning. Then I make him go hard to catch up, so I can photograph them with the full moon hanging huge above them. “You might have to help me paddle, if you want to catch them,” he says. What a taskmaster! Phil comes alongside to chat about river-life. The Clarence River supplies high quality seafood to fishmongers all over Australia and, before Europeans arrived, to the Yaegl folk of Yamba and Iluka. The word ‘Yamba’ means ‘plenty of mussels’. Another of Phil’s tours takes kayakers through the canals to an oyster farm for lunch. I am getting a little peckish myself and suggest to Sam that he could paddle faster as Freeburn Island and supper is our next stop. We glide into a curving white beach and clamber out. Everyone re-introduces themselves, this time laughing and sharing stories from the last hour, while Phil and Isabelle unpack dinner. It’s surprising how much can be stowed in a kayak. We plonk down on blankets to enjoy chicken wraps and a glass of wine for the grown-ups, watching the lights over the water and the glorious stars above. One guest knows a little about astronomy and someone else has the app, so a few phones come out for star-tracking. There’s cake to finish off, which makes the kids happy, then we return. The light breeze brings the sweet aroma of the ocean, just a few kilometres away. 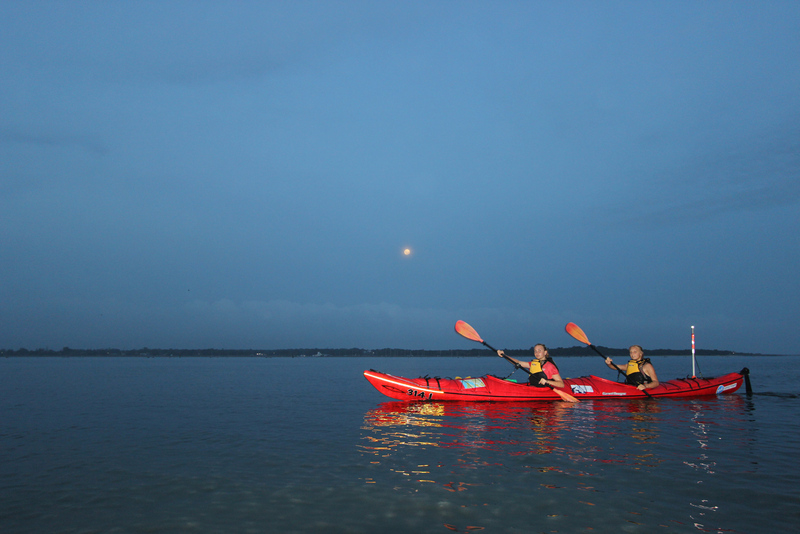 The dark water is lit by our kayak lights and the moon, creating gorgeous ripple patterns of red and white and yellow. The other kayaks look like star-dots of light on the water ahead of me as snatches of conversation and laughter float across the water. Gliding along in my kayak feels comfortable and serene. We pull up one by one and slowly climb out. The girls have been splashing each other with their paddles and are soaked and silly with excitement. 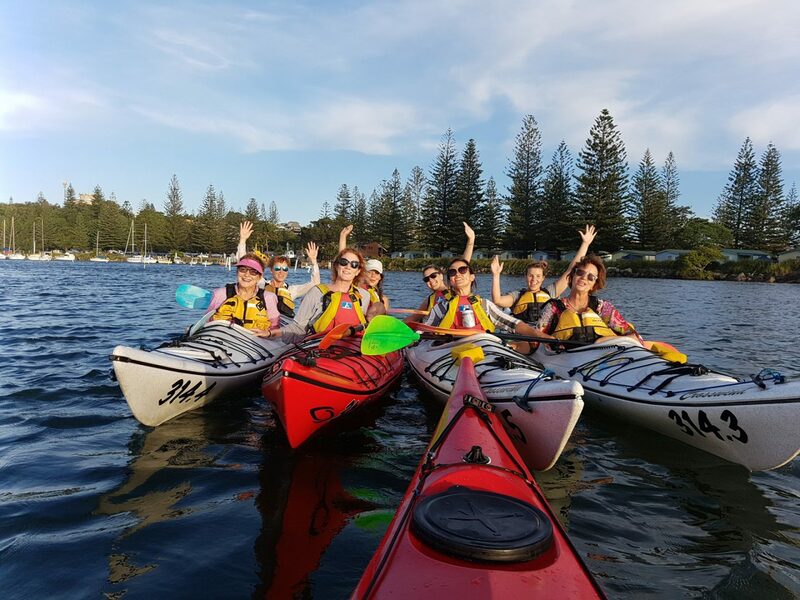 We were the guests of Yamba Kayak and we had a fabulous experience; now it’s time to check out what everyone else thought. That sounds like the gold at the rainbow’s end. Moon river for me!